By Dan Fuoco, Airframe Service Sales Rep. Rotating avionics boxes will make them accessible from the nose wheel bay, avoiding RVSM recertification issues for Hawker 800 series aircraft. Picture yourself on a trip, in the middle of nowhere, and you have to open the nose avionics bay access panels on your Hawker 800/800XP series aircraft. You’re at a field with limited or no service available, and you can’t open the access panels without recertifying RVSM. Now you’re stuck. Your only option is to fly out well below RVSM-approved flight levels. 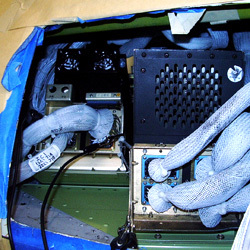 For Hawker 800 series aircraft, the avionics bay door panels are located in the RVSM critical area. If these panels are disturbed, the critical area will have to undergo a recertification. Typically, these access panels are opened only as necessary. Also, just as typical, when these panels are opened the aircraft is in the worst place at the worst time. The only way to avoid disturbing the RVSM critical zone is by making the avionics boxes accessible through the nose wheel bay. In this modification, the avionics boxes are rotated and the avionics shelves are modified to tilt down for box removal from the nose wheel bay. The avionics panels are permanently sealed and painted so you can’t tell they were ever there. The modification can pay for itself very quickly, and can be completed in about one week. Although it requires repainting the entire nose section, you’ll be able to access the avionics nose bay without disturbing the RVSM critical area ever again. The STC for this modification is only available at Duncan Aviation. For more information, download the Duncan Aviation Field Guide to Protecting Hawker RVSM Certification. Dan Fuoco is an Airframe Service Sales Rep. at Duncan Aviation's Lincoln, Neb. (LNK) facility, and specializes in airframe services for Hawker and Citation aircraft. He began working in aviation in 1974.